Once you’ve had solar for a whole billing cycle, you should check your electricity bill. Look at the average daily usage shown on your bill. Remember, in terms of consumption, the electricity bill only shows grid usage. It doesn’t show how much solar your home has used (see earlier for the reasons why). If you use lots of your electricity during the day, you’ll have a high self-consumption ratio and your grid imports should have dropped substantially. Figure 7.1 shows an example of the average daily cost and usage before and after installing a solar power system. Figure 7.1 Extract from electricity bill for someone who installed solar early in November 2014. In this example, the solar power system was installed at the start of November. The black line shows grid imports dropping from just under 10 kWh per day to just over 5 kWh per day. 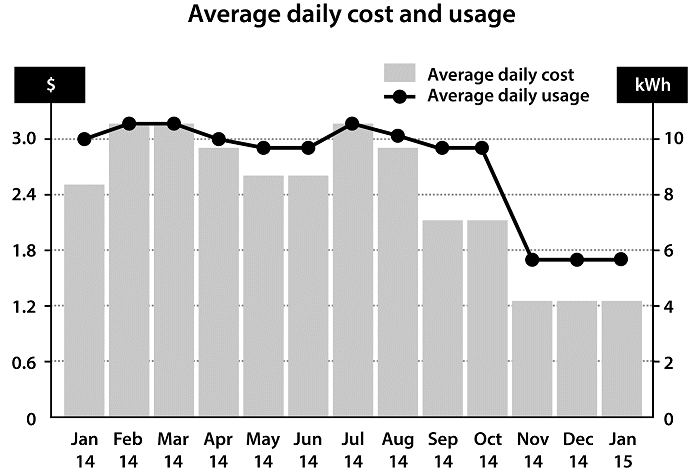 With a usage tariff of 30c per kWh, the daily cost has dropped by $1.50 per day. Check what you measured your pre-solar daytime consumption to be. Your daily use should have dropped by about that much. There was a long delay between your system being installed and your solar meter being installed or configured. The solar power system can only legally be switched on when the meter is ready. Your system isn’t working properly. You have increased your evening and night-time consumption since getting solar. If you’re confused or disappointed by your first electricity bill after solar, call your installer and ask them to walk you through your bill and your monitoring. A good installer will be happy to show you exactly what’s happening and how much money they’re saving you. Next, let’s go through the charges on your electricity bill. Look at your ‘solar buy back’ or similarly worded line item (clue: look for the abbreviation ‘CR’). 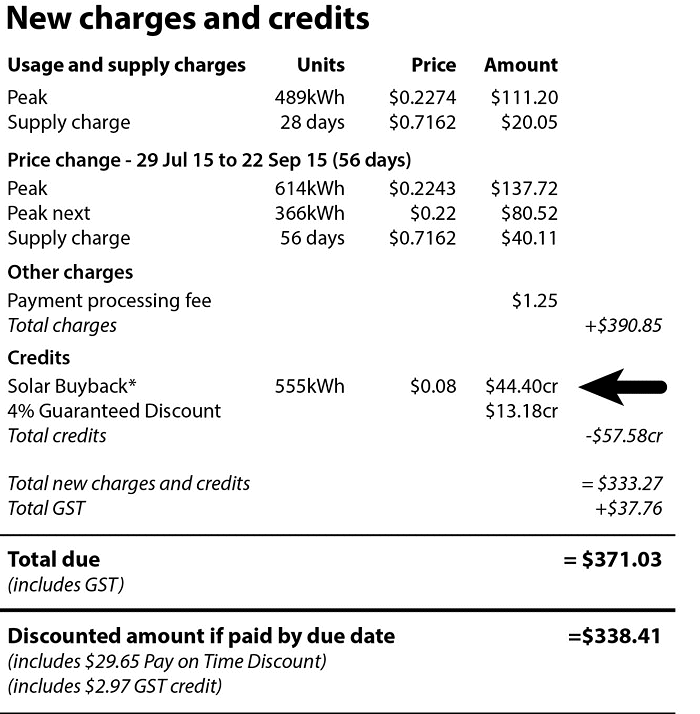 On the bill shown in Figure 7.2, the system owner gets two credits – one for their solar electricity and one in the form of a discount as part of their plan. You can see that the owner exported 555 kWh at 8c per kWh. That’s a total credit of $44.40. If you can’t find a credit for your solar energy then call your electricity retailer to find out what has happened to it. It’s not that unusual for your retailer to forget to credit you for your solar, so make sure you’re being paid. Also make sure that the rate per kWh is the one that was promised. See how many kWhs you’ve been credited for. Divide it by the number of days billed. If it’s a quarterly bill, that’s 90 days. In this example, that’s 555 kWh divided by 90 days, which comes to 6.2 kWh exported per day. Check that this number tallies with the exports reported by your monitoring.